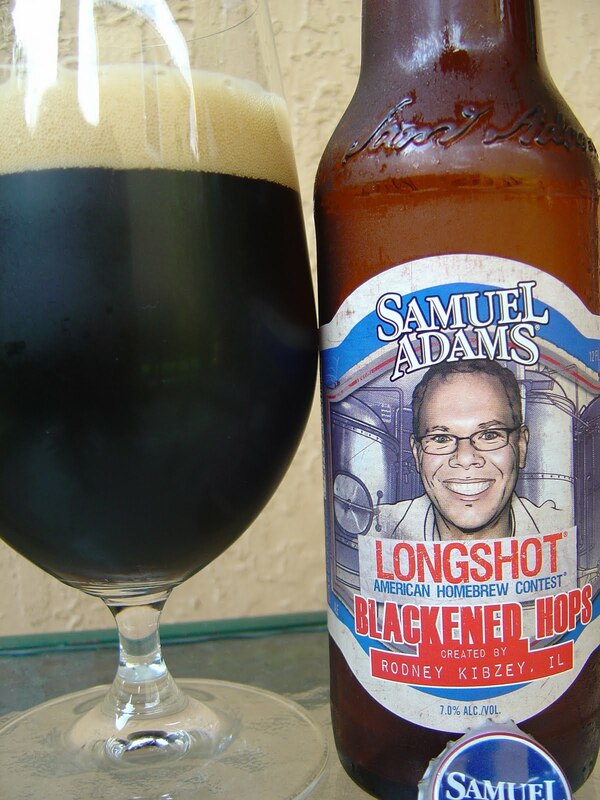 Today I'm drinking Longshot Blackened Hops brewed by The Boston Beer Company in Boston, Cincinnati or Brein (NO I) gsville, Pennsylvania. I've had their Friar Hop Ale and Honey B's Lavender Ale, hating one and not loving the other. Please let this be a winner! American Homebrew Contest winner Rodney Kibzey from Illinois created this beer and has his picture on the front of the bottle. Enjoy before September, 2011. Roasted malty and very hoppy citrus at the same time--quite the mixed-signal aroma! Roasted, nutty, malty yet orange and citrus flavors battle in an all-out civil war right from the start. Chocolate and coffee and bitter lemon. Cain v. Abel like you don't see too often. Medium carbonation, decent body, pretty smooth for all the animosity. Bitter does finally win though this is a mostly balanced beer. Dry finish, presumably aided by the 7.0% alcohol. You know, I get it. I guess Black IPA's just aren't my gig, though I think this beer can hold its own against most I've tasted in the category. By far the best of the three in this year's Longshot series. But for sure I am waiting for next year's competition and not lingering on 2011.